Love, Beth: Where Was I? 8/11 (Mon. )-Home from the hospital and feeling better. 8/12 (Tues.)-Back to work for one day before heading out to Ohio to visit Kevin's parents. I'm glad I got the sickness out of the way BEFORE the trip. 8/13-8/16 (Wed.-Sat. 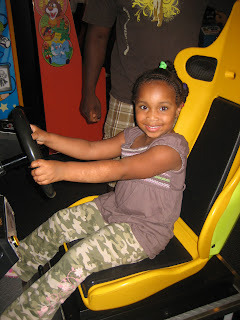 )-Kevin and I flew to Ohio to visit with his parents, sister, and our beautiful nieces. It was such a relaxing trip. We spent time watching the Olympics together and catching up on life. Kevin's sister and I went shopping one morning while Kevin babysat (and we actually came home to a quiet house! He had the 4-year-old playing and the 1-year-old sleeping-good job, babe!). Kevin had also promised to take the kids to Chuck E. Cheese's so we spent one afternoon there. We also spent one afternoon at King's Island, an amusement/water park not far from Kevin's parents home. (Don't worry, I didn't ride the rides!). It was good just being with family. Kevin was excited to get to visit before the semester started. 8/17 (Sun. )-I officially started my second trimester; three months down, 6 to go! 8/18 (Mon. )-Happy Fall 2008 Semester, Baby! Kevin is down to his second-to-last semester, and this will be a busy one. Pray for him as he juggles two jobs and a full time school schedule. The rest of this week has been pretty predictable. I'm feeling good. I even cleaned out the bathroom cabinets this week and dusted/straightened our bedroom, two chores which were long overdue. I'm trying to get things organized as much as I can in preparation for our move to a two-bedroom apartment. We are hearing several different stories about when we will be able to move so we are still unsure about when that will happen. Below are a few pics from our Ohio trip. Enjoy! 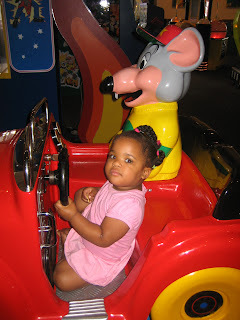 Kamile chauffering Chuck E. Cheese around. 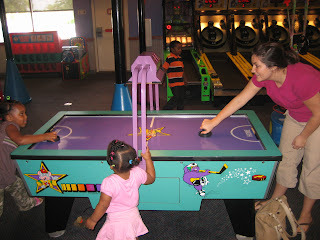 Me and Divine playing air hockey; Kamile cheering us on. 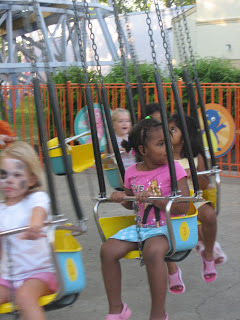 Divine riding the swing at King's Island. 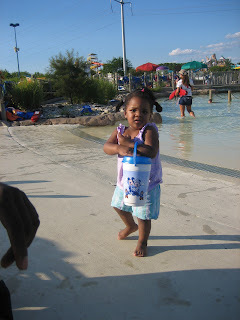 Kamile at King's Island. She was our water girl!